FILE - U.S. President Donald Trump and North Korea leader Kim Jong Un walk from their lunch at the Capella resort on Sentosa Island in Singapore, June 12, 2018. American lawmakers differed sharply in their reaction to the first-ever face-to-face meeting between a sitting U.S. president and a North Korean leader. 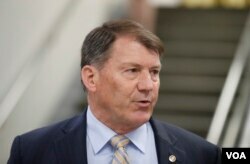 FILE - Sen. Mike Rounds, R-S.D., speaks on Capitol Hill, May 17, 2018. "This is the weakest statement I have ever seen come out of any engagement with North Korea. 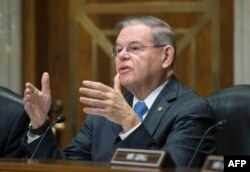 … So, we look forward to the administration telling us what is the path forward and what is the strategy," Democratic Senator Bob Menendez said. FILE - Bob Menendez (D-NJ) speaks during a foreign relations hearing in Washington, Jan. 9, 2018. Later Tuesday, Senate Minority Leader Chuck Schumer said, "We have legitimized a brutal dictator who has starved his own people. … If the United States is unable to win concrete, lasting concessions from North Korea, the meeting alone will be a victory for Kim Jong Un and a defeat for President Trump." 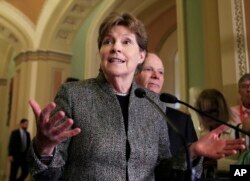 FILE - Sen. Jeanne Shaheen speaks to reporters on Capitol Hill in Washington, Oct. 24, 2017. ​But Republicans insist they are clear-eyed about the challenges ahead. "Anybody who thinks we're going to fix 50 years-plus of major challenges here in one meeting is not being realistic. … This is not easy and it's not going to happen overnight," Rounds said.